Guitar Hero has fallen on some hard times. It’s really a shame to see, honestly. I remember when it first broke onto the scene with Guitar Hero 2; at the time, Guitar Hero hadn’t fully captivated the audience and remained more of a cult game until Guitar Hero 2 launched it to phenomenon status. We got way too into it—I think it’s safe to say everyone did—completing the game repeatedly on increasing difficulties until we were playing Through the Fire and Flames on expert for fun. While Guitar Hero created the genre, there’s no denying that Rock Band perfected it, making it far more inclusive and a much better ‘party game’ to play with a group of friends. Since Rock Band’s release, it’s seemed like Guitar Hero has consistently tried to change their formula in an attempt to one-up Rock Band. Rock Band has a full kit? We’ll do the same, only our drums will have cymbals and our guitar will have some pointless slider thing. And while Rock Band consistently turned out hits with gameplay that Guitar Hero created, polished to perfection, Guitar Hero oversaturated its own market in an attempt to stay relevant; remember DJ Hero? One of their games was even called Band Hero. 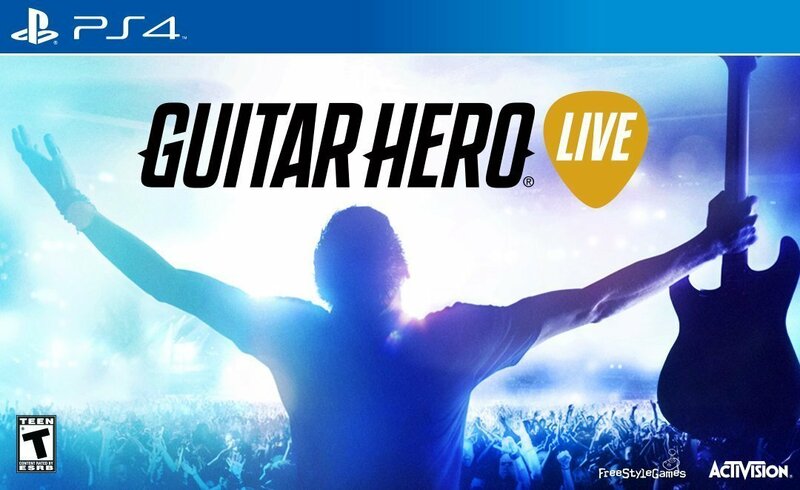 I find it odd that with the big push to reinvigorate the franchise, where Rock Band 4 refined an already perfect formula, Guitar Hero Live tries again to reinvent the wheel rather than polish the perfected wheel they brought to the market, and this makes Guitar Hero Live a significantly lesser experience. Guitar Hero Live is certainly an interesting experiment. Visually, it’s the best looking game out of the Guitar Hero/Rock Band franchises, and this is largely due to the game’s ‘live’ visuals. I have to give credit where it is due: the amount of effort that must have gone into filming each of the different tours, the audience participation, their reactions to your performance, it’s really incredible. The way it’s shot in first-person does add that fun, immersive feel to it. Although I will say it is very odd how your bandmates react so negatively to you playing poorly. 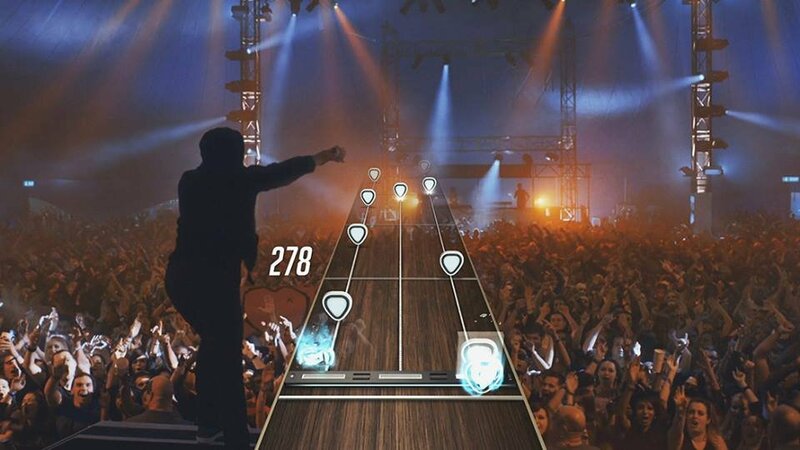 I found myself thinking, “Hey guys, come on, we’re on the same team here!” I would say it’s the most immersive version of Guitar Hero, up until you remember you’re playing on a plastic guitar and using magic to amp up the crowd. The set list is enormous, containing well over a hundred songs on disc with more being added on the Guitar Hero TV section. I found it very odd that many of these songs were from previous versions of Guitar Hero. I know this may seem like a minor complaint; however, it just seemed lazy to me. Given how many great songs are out there, there was really no reason to rehash songs from previous games. Preference is a big factor in whether or not you’ll enjoy this set list (I honestly only found 3 or 4 songs that I was excited to play and a lot of other songs I thought “Ew, why?”). However, given its size, there’s definitely something to please everybody. The GHTV section was an interesting take on the online multiplayer mode for the game. 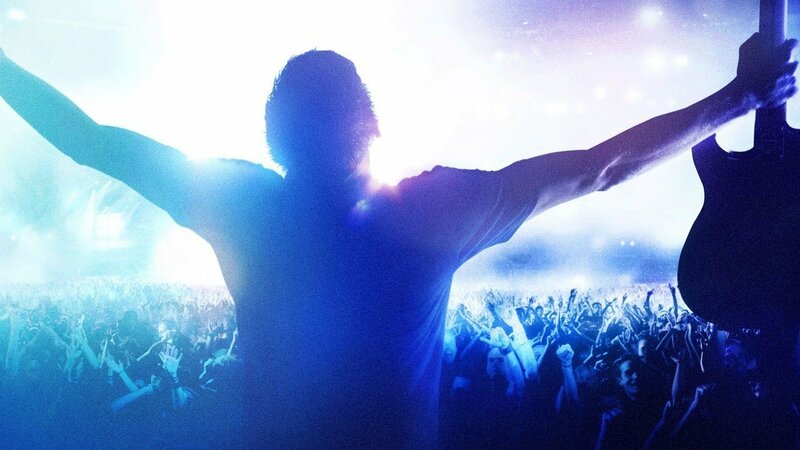 Having mostly negative experiences playing Rock Band online, it was interesting to see a free-flowing game mode that included multiplayer elements like a leaderboard, a levelling system, and unlockable items to assist your score. GHTV allows players to choose a ‘channel’ and play along to music videos within that genre. It’s basically Spotify that you can play along to. While players have no control over what songs will be within their channels, they can pay to unlock songs they like to play them as many times as they want. 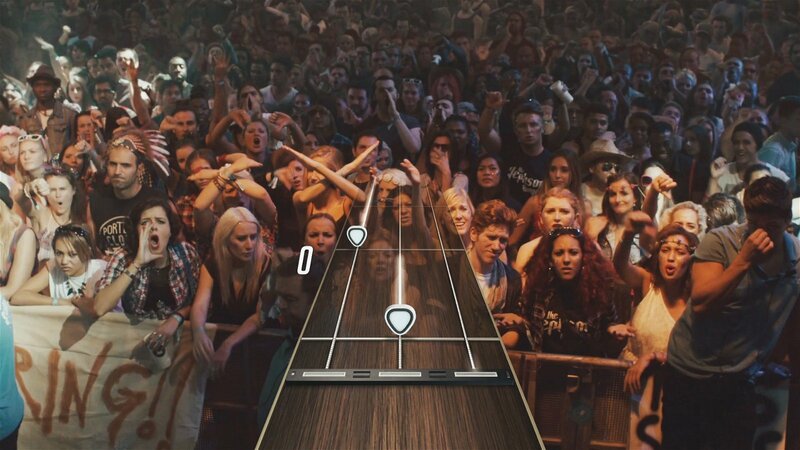 For all that Guitar Hero makes up in look, content, and style, the whole experience falls apart, for me, in its most important aspect: the guitar. 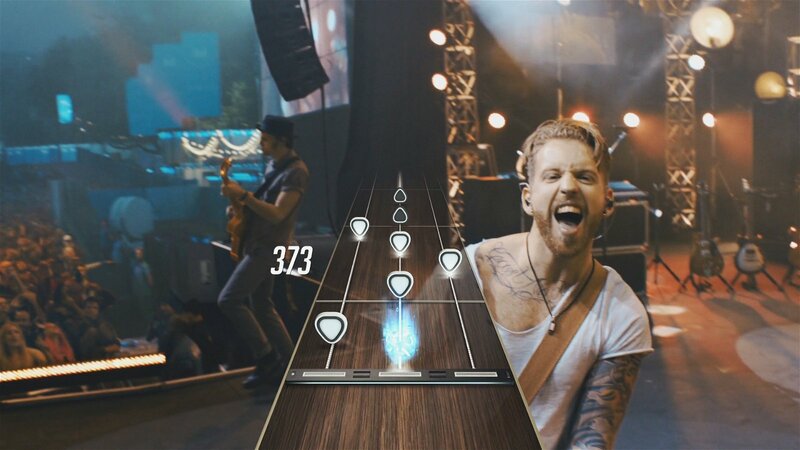 Guitar Hero Live has a redesigned guitar controller that axes the five-button neck in favour for a three-button neck that splits the buttons in half. Notes no longer come in the variety of colors, but rather in white and black that symbolize the top or bottom of button. The only difference between the two are black notes face down and white face up, and often it’s easy to confuse the two when you instinctively press the button where the notes are lined. I found this to be extremely frustrating, as the buttons are so close together that when the game starts combining top and bottom notes, it became very easy to lose track of my finger placement. Not only that, but because the size of the neck on screen remains the same, often I found myself stretching my fingers off the buttons, reaching for buttons that were no long there. While this could stem from my familiarization to the old controllers, it really felt deceptive to me, since you’re not looking at the guitar, you’re looking at the screen, and in the heat of the moment, seeing those notes stretched far apart, you instinctively reach further than you have to. I couldn’t see how newcomers to the franchise would find this more enjoyable; it feels like a system that’s far more complex than the traditional five-button neck. The fact that they’re so close together in their top/bottom forms makes it incredibly hectic to switch between them when the game starts combining the two. Even after I had become more accustomed to it and switched over to hard mode, I found that while I was still able to complete the songs, the layout of the buttons made songs more a test of attrition than a genuinely fun experience. I’ve heard a lot of people say that this is a better system and it’s more analogous to playing a real guitar, but I’m not loading up Guitar Hero to play real guitar. I’m loading it up for some fun, rockstar escapism and, in this regard, the Rock Band guitars provide for a much more fun experience. One of the other big problems about this guitar—and it’s also a big problem of Guitar Hero Live—is its complete axing of backwards compatibility. Because the system is entirely different, previous generation Guitar Hero peripherals are no longer compatible with Guitar Hero Live. However, that doesn’t explain why Guitar Hero Live doesn’t allow you to import any DLC songs from previous Guitar Hero games. While they have announced consistent updates to the GHTV platform, the fact that you’ll still have to buy songs from the network—songs you may have already had—is a real detriment to the whole experience. Guitar Hero Live has a lot of good qualities to it. It’s extremely polished and extremely functional. If it wasn’t for some questionable design choices with the game’s most important element, it could have been a flawless experience. However, for all the things that make Guitar Hero good, its guitar really holds it back from being great.